I love all of the Facebook recipes - the fast videos, the pictures, etc. I save them and look back when I need a new, fun recipe! Some are easy, some are hard and some seem outrageous - things I have never thought of! That is why I like it! I can't believe I haven't made this recipe before. I keep the large container of pesto from Costco in my fridge. This recipe didn't take many ingredients at all and was a snap to make. Chris and I both enjoyed it. I loved the texture of the fresh mozzarella after baking! There ends up being a lot of juice from the chicken and the pesto. I recommend a side of rice to enjoy with your chicken..... or even pasta. Chris especially loves rice so we had Pesto Chicken, rice and roasted cauliflower. Enjoy! Preheat oven to 400. Spray your pan with a cooking spray. Layer your chicken tenders down your pan or place your chicken breasts. 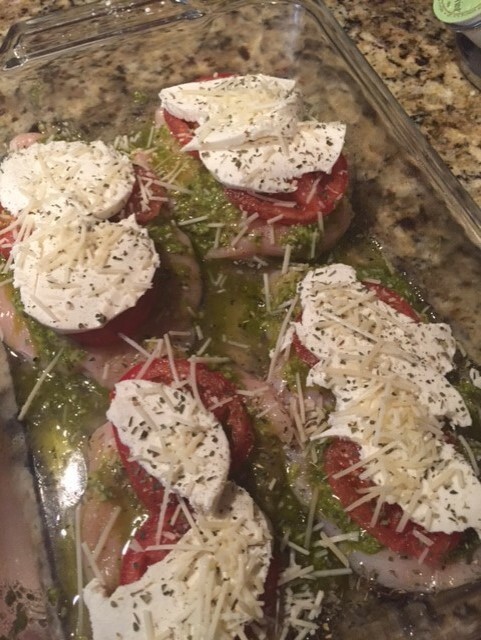 I topped each chicken breast with 1 Tbsp or so of prepared pesto. Top with tomato slices. 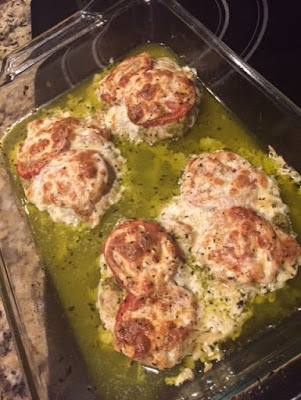 Top with fresh Mozzarella cheese slices. Sprinkle with salt, pepper, Italian Seasoning and shredded Parmesan cheese. Bake at 400 for about 40 minutes or until chicken is done.